BANG! I was awake, and needed to find out why I would have left him in the hospital if I had intended to keep him. Having been constantly asked to give a run down of the history of Origins which led up this inquiry, we thought now might be the right time to put out a brief synopsis of events. But before I continue I want to say that having never written about my own experience, finding it more comfortable dealing with the general politics of adoption, at this point I should apologize for all the me, my's and I's at the beginning of this article. However in giving as accurate an account as possible of the steps leading up to how the inquiry 'got got', I'm afraid it can't be helped. Without going through our files for the exact date, a few months after obtaining my social work reports, I recall opening the Sunday paper later in 1991 to read the words National Scandal emblazoned across the front pages of the Sunday Herald. I went into shock after reading about unmarried mothers having pillows shoved in their faces to prevent them from seeing the babies who were being taken for adoption. My head spinning as the memories of my hospital experience came flooding back. All I could see was the phone number at the bottom of the text. The following day I phoned the number and spoke to a woman by the name of Christine Pierags who was a founding member of the group called Parents of Children Lost to Illegal Adoption. During discussion with Christine I explained how it had been my understanding that as a minor of 16, I'd had no right to make a decision, but that adults had that right to make the decision for me. I learnt from her that that was not the case at all, and how an unmarried mother was the sole legal guardian of their child until the consent was signed. It was my per chance connection with Christine Pierags that instigated my own personal quest for justice. I immediately applied for all my other legal documents under FOI..
Christine's group had been the first to publicly called for a Royal Commission into the coercive practices in past adoptions in 1991 and was due to set a date to meet with politicians. Illness however, prevented her group from continuing. In late 1992 I contacted the Kingsford Legal Centre with my plight and was passed on to Robyn Sexton, - a lawyer in Knightsbridge. We discussed my chance for litigation whereupon she waited while I continued trying to get additional legal documents and prescribed information. The tears kept flowing and the pain kept growing while I put her temporarily out of mind - as I went out of my mind. A letter I had received from her some months later in January 1993 rekindled my need for answers. My sanity relied on finding the truth. By January 1993 I'd joined a small lobby group of mothers but soon realised it was focussing on making changes to present adoption legislation and future reform, whereas a few of us felt we couldn't effectively fight for others without facing the past and exposing our own demons first. It caused a division of directions within the group as we each focussed on our individual aims. On July 23rd 1993 I nervously presented my first paper at the NSW Law Reform Commission Forum where the Hon. Richard Chisholm had the unenviable task of passing me tissues as I cried my way through telling the audience all about the evidence I had in my hands which showed proof that I had been separated from my baby at birth, how my social work report declared that I wanted to keep my child, how I had signed under the influence of heavy sedation, how my breast milk had been polluted with barbiturates and Stilboestrol and could harm my child had I'd breast fed him, how if they didn't believe that coercion was used then they should have destroyed the evidence Blah, blah, blah, and how adoption had to stop being a service where in order to save the child one must first destroy his mother. As I stepped off the podium, I was approached by a mother who declared how I had just told her story up there. Together we briefly shared our histories over lunch as I told her I was preparing to take legal action. We agreed to meet that Sunday where we decided we would act together. Unbeknown to each other my colleague (who has chosen to remain anonymous) had also made the very same connections with both the Kingsford Legal Centre and Robyn Sexton prior to our meeting... Within 2 weeks of having met we were contacted by Robyn Sexton who informed us of her discussion with a prominent QC who was willing to speak with us. That same night she called again to say we should contact the Public Interest Advocacy Centre the next morning, tell them it's urgent and drop the Q.C. 's name. I got an appointment that afternoon at 2pm, my colleague at 4pm. After 15 minutes, the solicitor let me know he was willing to take on my case but needed to confer with his colleagues before any definitive agreement could be met. Ditto with my colleague. Six days later I was called into his office to check my statement of claim, and to sign an affidavit to guarantee that I would pay the Supreme Court and oppositions costs if I failed in my fight. This meant I had put my home up as collateral and risked losing it, but I somehow knew that if I resisted or sounded doubtful it could mean the possibility of my case not being accepted by them. I signed immediately. Nothing else mattered. NB. At the eleventh hour, just prior to entering the courts, Legal Aid came to the party and covered all cost as they saw the case as being of major public interest.. I had given no thought to whom I might be suing as all I really wanted at the time was for someone to say "what a dreadful thing has been done to you". And so when I read that I was one of two plaintiffs who were suing the State of NSW I almost drowned in tears of relief as I realised what a serious matter this was - much bigger than I was worthy of. I think it was at that very moment of validation that my confused, smothering years of oppression and anxiety fell away like a shroud and my mind could see clearly for the very first time. During the few weeks since I had met my colleague she added to my growing knowledge and advised me that there had been financial assistance that could have allowed me to keep my child. And also informed me how I was to be warned of the risk of dire future regret before I signed any consent and eventually provided me with these two relevant documents. Having knowledge of such information since the 1980's, I wondered why she had waited so long before taking action and why other mothers hadn't been made aware of it. I felt that a picture was beginning to emerge of us having been victims of a dreadful social cleansing programme. What began as a good team was not to last. For reasons known only to herself, within a short few months, but upon our Barrister's Memorandum of Advice being issued where he had decided to take on my case as the test case, prepare the second in the event that we got through the statute of limitations, then push her case through, things changed, and no longer would my colleague offer any further documentation nor share any other evidence that she was privy to. I found this difficult to understand as her case relied on mine getting through. It seems I had to earn my own stripes from then on in and realised how I had to set about finding my own historical documents. Luckily overturning the statute relied only on my own experience and documented evidence. Nothing else could be introduced. Had I managed to get through to take my case to court, then her evidence would have become vital to us both. Because of this situation having arisen, it meant I had to begin scouring the Fisher library for months at a time for anything to do with adoption prior to 1968. Pertinent documents seemed to jump off the shelves and fall into my hands as if I was meant to find them, but each time I had shared my discoveries I would be told she had the document somewhere in her garage. I was being punished for our barristers decision. Our friendship sadly floundered. Nevertheless out of this sad situation between us, I began to realise I had personally learned much more than I might have in having built upon and conducted my own further research, and was able to expand on what I had gathered at the time. Nevertheless support was there in abundance from other colleagues I'd met earlier such as Linda Graham, Wendy Jacobs, Robyn, Denise Grey, Anne Thompson, and others, many to become friends, allies. The following year Chris Cole joined our team, and a year later we all became the Origins Committee. It was about this time that my personal case stopped being mine and had become ours. During this time tragedy struck Wendy Jacobs, with her beloved son Andrew, committing suicide. It was a shattering shock for us all and something each and every one of us dreaded. Who would be next? How would she cope? How could she cope? I suggested to Wendy that we would understand if she wanted to move on and try to get on with her life, but she said 'No' she would continue to press on as she didn't want her child's death to be in vain. Chris, Trish Farrer and I presented papers at the 5th Australian Conference on Adoption in 1994.. We made such an impact on a visiting social worker from the UK, he stood up at the forum to end the conference on day three, and publicly apologised to all mothers on behalf of his profession. The entire room seemed to sigh and let out a huge sob of relief.. Our first apology - at last. The International Women's Day March in 1995 was a tremendous success (in our eyes at least) as we led the parade and managed to get page three coverage in the Sunday papers. The following day I was issued with an ultimatum by my colleague where I was informed that there was not enough room in the group for us both. One of us had to go. I decided it would be me. Along with an unexpected, violent, and very public assault from another the previous night, so spelt the end of my association with the group I'd belonged to for 2 years. Reeling from both attacks, I resigned immediately. With the next business meeting a week later, seven other Committee members also resigned. A month later in April 1995, after consultation about the direction our new group would take, preparing our new aims and objectives, agreeing on a name, and with a total membership of 12 mothers each co-founding our new organisation, and fuelled by newfound enthusiasm, Origins Inc. was born. By June we were officially up and running. While Denise Grey set up our first interstate Origins Support group on the Gold Coast, other members came and went and came back again, as they were emotionally able to, but we each played our part and knew it was vital to be cohesive as we focussed on our aims and objectives. Our newsletters were our most important medium as we knew it would take time for mothers to let go of their oppression and integrate this new paradigm we were presenting to them.. We relied heavily on Robyn's invaluable participation with the newsletter.. Without her assistance we would have no inquiry as we had no other way of passing on our research, and our organisation had no money to pay for mountains of photocopying. Robyn also provided all the archival newspaper articles that gave us insight and evidence into adoption propaganda being used through the 1960's. Wendy began her own fearsome research campaign in earnest and started gathering mountains of literature and archival documentation from both the Bosch and the Fisher libraries. Focussing predominantly on known mental health case studies and research into the adopted child, as well as many very significant historical adoption documents that helped to piece the big adoption picture together. Eventually we had our growing army of members sending us all types of archival documentation. Each as valuable as the next - all pieces of a gigantic social engineering strategy that would allow us to present as vital evidence in our quest for justice. By June 10, 1996 the break we had waited for occurred with the disclosure coming out of Tasmania that some 50 mothers who had been told their babies had died, had been found by their so-called dead babies, having been adopted instead. On that very same day the letter I had been waiting five years for had arrived. My son had finally responded to my earlier outreach in 1991. We were inundated with the media. Thankfully I had done my homework when Julia Delvecchio of the Sydney Morning Herald phoned to see if any of our mothers had been told their babies had died too. I advised that while some had, it was not new news for us as the Law Reform Commission had noted this practice in their Report 69 back in 1992. I went on to say how it was possibly linked to what was known as rapid adoption, and that such abuse was only one aspect of the abuses perpetrated against young single mothers. The following day with our allegations being officially confirmed the heading 'Baby Snatchers' was emblazoned across the SMH whereupon we were inundated with every conceivable newspaper, radio and TV station. And Origins took off across state borders. Many Origins members, too many to name personally, began being interviewed for the print media, and radio. Vivian and I went to air on the following day. My legal case got it's first official airing too. The response was enormous. During this time Vivian Lindsay had begun an Origins support group in Newcastle and flew down to Tasmania to offer support to the mothers down there, and through her radio interviews collected the names and numbers of the women phoning in to help to set up our first Tasmanian Origins group who have gone from strength to strength. Derryn Hinch interviewed us and many other mothers unconnected to our group for almost an entire week. ABC and Radio National had us on air. Channel 2 channel 7 Channel 9. The list goes on. Having heard about our pending legal action against the State, in November 1996 Allen Franks, journalist for the London Times was sent out from the UK to interview the new English Police Commissioner Peter Ryan and to get the story on the two mothers taking action. My colleague continued to refused any publicity and so I was interviewed with a number of other mums including Vivian Lindsay, Trish Farrer, Anne Thompson and an adoptee Barbara. Margaret McDonald was also interviewed. The article hit the London Times and as a result we made contact through Allen Franks, with Pamela Sharp of the UK who had begun a group of like minded mums also wanting to take action for their adoption abuse. Pamela and I met in Melbourne in 1997. Inconceivably we had gone international and were so proud to become affiliated with each others groups. Our phone had always been busy but so much more so with each media coverage. This time was no exception. Because of the nature of the calls being received, those who manned the phones, Linda Graham, Anne Thompson, Wendy Jacobs and myself were all suffering vicarious traumatisation. Ourselves. It was then I phoned the DOCS office to politely demand that trauma help be set up for mothers who are suffering adoption distress as we could not cope alone with the overwhelming response to the media. Speaking with one of Ron Dyers Advisers, Tony Pooley, he acknowledged that their Department was very much aware of the level of trauma caused by adoption but declared that the Government was waiting to see if the two cases going before the Courts succeeded, as the Government will only put their hands in their pockets if they are forced to do so. I was both exhausted and livid to think the health of our callers and ourselves relied on two women winning their court cases - and let him know it. The Public Interest Advocacy Centre (PIAC) soon called a meeting with us to discuss how they could provide their assistance with our request for a national inquiry versus a state inquiry, informing us that a push for a national inquiry at this point would take years as it would mean having to get all state governments to agree unanimously and it would be almost impossible to get quick action. PIAC felt that as my case was drawing near it would be a good idea to look at getting interest in an inquiry on a state level up and running. In mid 1996 I helped PIAC draught the first 3 page questionaire to be sent out to our members through the newsletters as they wanted to ascertain how widespread these practices were before entering into an inquiry and/or a class action. As a group we were only a year old, and not sure if we were quite yet ready for an inquiry as we weren't too sure how many members would be emotionally ready to respond or whether there were even enough active members to really make an impact. Realising how traumatised so many mothers were and how time is needed to de-program ourselves, we were a little concerned that we might begin a war and nobody show up. We needed to wait a while longer. So much was happening during June - July 1996 with contacts being made across the country. One such mother being Elizabeth Edwards who began her own research which ultimately resulted in Origins Melbourne being formed. With the message getting out there we noticed our members getting stronger emotionally and how more and more adoptees were beginning to call wanting to know how their mothers might have been treated and that choices they had been given. They were beginning to let go of their understanding of adoption, and were less aggressive than the had been previously. It was coming as a great relief to them to know they might not have been unwanted after all. We knew we were on the right track. A great media shift had occurred because of this enormous coverage. The exposure finally put paid to the media using terms such as 'I Gave My Baby Away' and began being replaced with eg. 'Mother forced to surrender baby'. We had arrived as a forceful group. Somewhere in amongst all this I went to court twice and twice failed to overturn the limitations argument. We had all been hanging our hopes on getting past the statute but on the 10th July 1997 my case failed again for the third and last time. It was disappointing but nevertheless provided the vehicle to make our call for an inquiry more supportable. It also provided vital evidence to submit to the eventual inquiry. After 6 years on a mission I think we were all too physically and emotionally exhausted to even get upset. It had all taken it's toll on my health and in between my commitment to Origins, I spent a month or so staring at walls watching the paint dry, as we wondered what the next move should be. On 15th September PIAC wrote explaining how I had failed in my 3rd fight, and expressed how the courts do not always deliver justice especially in cases about events a long time ago, but remained interested and offered us assistance in seeking an inquiry, I subsequently compiled a form letter to be included in the newsletter for our members to send off to the Minister for Community Services Ron Dyer seeking his reaction to an inquiry. Naturally it was dismissive, telling us that although they were aware of the long term grief caused by adoption it was the social mores of the time. We were too smart by this time to accept the old 'here's your hat, what's your hurry' routine, so I phoned the Minister's DOCS office again, but this time to take umbrage at his boss's dismissive letters of reply to all our members who had written calling for an inquiry. I told him we would not accept his brush off as being merely social mores of the time. I was told we would get what we want but we needed to be patient. 'Only one person above is against your call for an inquiry and he wont always be in the position he is in'. Anne Maria Nicholson of Late-line called the office about doing a program on adoption. It was shown on the 21st October 1997. It was a good move and in it I publicly called for a Royal Commission into adoption practice on the groups behalf. Christine Campbell, Shadow Minister for Community Services supported our call on behalf of Victorian Mothers. Linda found the courage to expose her painful adoption experience and did a wonderful job. Dr Rickarby declared adoption to be harmful to all parties and how it should be stopped utterly. I took on the social worker and understand it was the first time anyone had officially accused the Government and adoption agents of breaking the law quite so publicly. It provoked enormous interest and allowed people to finally understand our issues and to get the bigger picture. No longer being able to rely on my case to begin an inquiry, we felt it was time to officially hit our respective local ministers to obtain support for an inquiry. What we had been working toward for four years had finally arrived. Chris and Vivian made the move to contact their local MP's Pat Rogan who presented our issues in a private members statement in Parliament on 12/11/97 while simultaneously Bryce Gaudrey MP did the same on 14/11/97. Two other members did likewise and both Jill Hall on 26/11/97 and Diedre Grusovin on 27/11/97 also presented to Parliament - all within a week of each other. Lily Arthur and Linda Graham both did likewise but no-more Parliamentary calls seemed necessary. Linda's MP provided her support by attending the press conference on Channel 10 news. Many other Origins members also contacted their local members for support and local papers ran individual stories in our promotion of the inquiry to get as many mother aware of what was going on as possible..
We held our first small Rally in front of Parliament House. No media was there but the adviser to the Minister grabbed my arm and once again said 'you will get what you want. Just be patient'. While Chris and Vivian kept in close contact with their MP's offices taking direction from them, Vivian launched an amazing publicity campaign in the Newcastle area and Chris did likewise in Sydney. Meanwhile my job was to arrange for mothers willing to participate in media coverage. Compass had called and asked for mothers from Carramar to take part in a programme. Linda Graham and Anne Thompson accepted and were fantastic, even if they did have to share the spotlight with Bettina Arndt. Witness put on an emotive program about Catholic adoptions which included Di Walton, Gail from Canberra and a mother from Melbourne. Gail Bell, once an active member of an earlier group soon began Origins Canberra about this time, while Phillipa Boldiston who had been fighting to have her abuse acknowledged for twenty years began Origins Western Australia. 7.30 Report covered the 2nd big rally and called and arranged a group of mothers to participate. Julie Bauers and Di Walton courageously complied, baring their souls. There was much too much publicity to fully remember them all. Meanwhile I set about putting together a list of our legal rights and a general list of the drugs, abuses against mothers etc that I'd been made privy to as the phone and meeting support facilitator for Origins to be passed on to Pat Rogan to work into his parliamentary speech.. Chris took on the responsibility of e-mailing the lists to every politician in the state to request their support. At the open rally Linda Graham and Trish Farrer held court with the media in front of Parliament House during the morning while Lily Arthur, Vivian, Chris and I spoke at the meeting held in the Parliamentary theatre that afternoon. Around fifty people turned up. Guided by Pat Rogans office, Chris arranged a channel 10 press statement. Clover Moore attended on behalf of Linda Graham, Chris called Pat Rogan. Vivian, Merilyn and another mother attended as their MP's came in support. My local member was the Minister for Police Paul Whelan and impossible to get hold of quickly, but I've got his number for future use. Soon our phones were too busy for me to handle alone and the Committee stepped in to share the load. Members and others were calling to ask what they could do to help. Everyone wanted to help us get this off the ground. 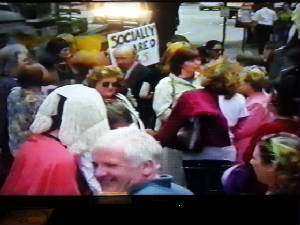 Lily, Barbara Hardy, Marieanne H, Sheila, Julia P, Janet, Rosemary, Mary, Linda and many more either found the courage to attend the public rally or expose their identities through the media. As Traumatic as it all was for all, everyone did their bit. We were not going to hide in shame any longer. A week later our biggest coup came when Ron Dyer was removed as Minister for Community Services. Whether he was pushed or jumped is not known, but our ship had come in when he was replaced by Mrs Fay Lo-Po who immediately promised to make our issue a top priority after Christmas 1998 when Parliament resumed. I'd since been informed that the reason Mr Ron Dyer refused us an inquiry was that he had been a lawyer who had arranged adoptions prior to entering politics. Not long after the NSW politicians had received our requests for support the replies came flooding in to the office. While many were supportive of us, and others kind enough to wish us well but let us know our issue was outside the realms of their portfolio, only three were decidedly in the negative. One such reply in particular stood out as more suprising than any other. It was from a politician I had heard so much about over the years. I had been told she had been well informed about adoption matters and was supposedly on our side. Her response indicated otherwise. Anne Symonds MLC, had chaired the previous adoption inquiry that resulted in the Information Act 1990 being passed to enable us to find our missing relatives. However she had made it clear in her letter to us that she felt there was no need for an inquiry of the sort that we requested. She only saw those women who had signed under day five. And those who had been told their babies had died, as being the possible illegal adoptions and indicated that she was willing to hear more about them. I was floored.. How could she have sat through an inquiry into legislative change, hearing mothers during the eighties speak about their dreadful hospital experiences and lack of options, and in 1998 not see that they were illegal acts of gigantic proportions? She had obviously not been aware of adoption law at all. On the other hand, Jan Burnswood who is chairing our inquiry, wrote a letter of congratulations on obtaining our much needed inquiry. In March 1998, Pat Rogan MP and Bryce Gaudrey MP had arranged a deputation for Chris and I to meet with the Hon. Fay Lo-Po to plead our cause. It was accepted immediately on humanitarian grounds. A few months later Chris flew to the UK to attend a conference organised by Pamela Sharp and to catch up with family, where she was highly successful in generating enthusiasm for their own push for their own inquiry. Unfortunately upon her return, other members had had their noses down, bums up without sleep, and days without showering, to meet the inquiry's deadline for the Origins submissions to be lodged, let alone our personal ones, contact between the committee was very limited.. Time not being on our side and each so caught up with our immediate priorities to the inquiry here at home, we failed to fully acknowledge her good work overseas before resigning from the group. A little while later Tony Pooley, legal adviser to the Ministers office contacted me to see if we agreed to the three points drafted up as acceptable to us as the inquiry's official terms of reference. Only two points needed altering. One was that the inquiry needed to include the period from 1950 to 1998 and not stop at 1990. The other most extremely significant change that needed to be made was to point three. The original wording of, 'what support provisions would assist persons experiencing distress due to such adoption practices', needed to be changed to read 'what measures would assist persons', Etc. This small change in wording meant that rather than merely bunging on a few more support counsellors to offer grief counselling, we were able to call for a large host of actions to be taken as a way of atoning for past behaviour. Whether they will be agreed upon is in the lap of the Gods for now, but we have let it be known that we mean business. By early June the inquiry was officially announced, giving us originally only seven weeks to knuckle down to putting our research together. And present all the documents upon which our submissions were based, to the inquiry, as well as making our own private submissions. The 31st July 1998 was D-day.. We were very concerned that this would not be sufficient time to enable our members to make submissions either and thankfully the inquiry coordinators soon realised the level of trauma the mothers were in and extended the time limit to May 99 when the inquiry began in earnest. Meanwhile the researchers on the Committee knuckled down to put together their individually collected material gathered over the last five years to present as evidence to the inquiry, while others took over the responsibility of providing the necessary ongoing support to our members and new callers..
Wendy Jacobs mounted the enormous task of compiling her three major submissions covering the long known mental health consequences to adopted children, suicide, mothers, and more. Lily Arthur compiled a compilation of chronological papers on adoption and mental health consequences and a submission based solely on the use of the synthetic hormone Stilboestrol - which is an issue soon to be addressed..
Robyn focussed her submission on the period between 1990 and 1998, which included what unsuspecting young mothers are now being provided with by way of recent adoption literature, videos, tapes etc, including damning adoption kits compiled by the adoption industry which explains how to go about promoting adoption to pregnant girls in the 1990's, etc. I presented a 200 page historical, evolutionary account of adoption regulations, legislation, conference papers, minutes of meetings of representatives of unmarried mothers hostels etc, etc, using their own words via the contents of the adoption industry's own archival documentation, as our evidence against them. Nothing could be left to chance, nor could we rely on any anecdotal here-say written after the relevant periods as we could not afford to risk a whitewash. Katie Ceccaldi has been an Origins member for many years and became a committee member last year. Katie is our cherry on the icing on the cake. A lawyer, Katie has put together Origins Submission No.2 by dissecting each point of my submission, adding more of her own, and from a legal perspective put each and every act of criminal malpractice into its legal context. This means that we no longer have to rely on the inquiries lawyers to do the leg work to discover what laws have been officially broken and in what context that occurred, but because of her expertise the inquiry's lawyers will now only need to try and dispute her legal knowledge. Thankfully, because of Katie's involvement we are no longer under threat of being white-washed. There is still much to do and we remain up to our ears in analysing, policing, and countering the conflicting evidence submitted to the inquiry by the opposition. In so belatedly fighting for our rights and for the truth to be told, funnily enough, Allen Franks, journalist for the London Times in 1997 described us as being 'like a cavalry that got waylaid'. A Toast to us all - make ours Moet!!! So in a birds eye view there we have it. Our little army of wounded soldiers has each had our part to play and thanks to each and every one of you, our members, some who haven't been personally named, and others who were courageous enough to go back and remember, and to make their traumatic submissions, to the politicians who support us, and to our hero, Dr Geoffrey Rickarby who has put his professional neck on the line for us and our displaced children, in the name of truth, we have taken the first step in achieving the impossible. We have set a world precedent which has begun a snowball effect around the world.